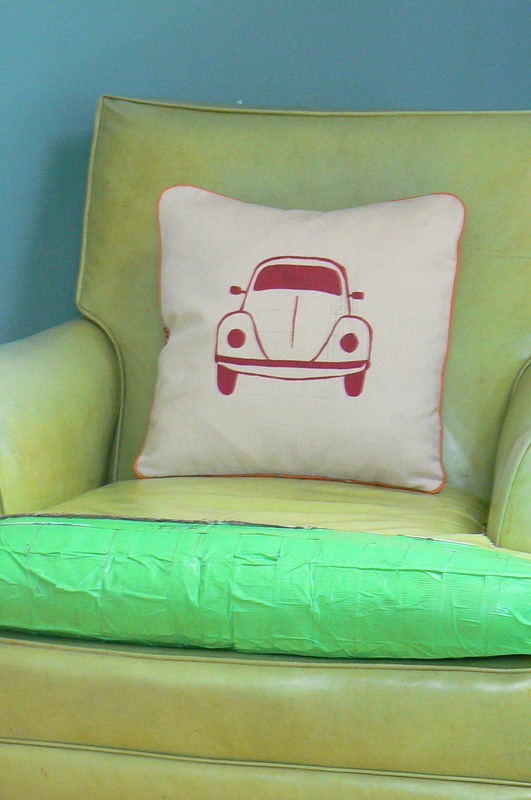 Tell the truth: are you focusing on the VW bug pillow or are you coveting the vinyl chair held together with lime green duct tape? Sorry, but it’s a one-of-a-kind treasure that only the luckiest few can possess. Summertime may not be optimal for freezer paper stencils–using an iron in 90-degree heat can be a wilting experience. But well worth it, of course. (Here are step-by-step instructions.) 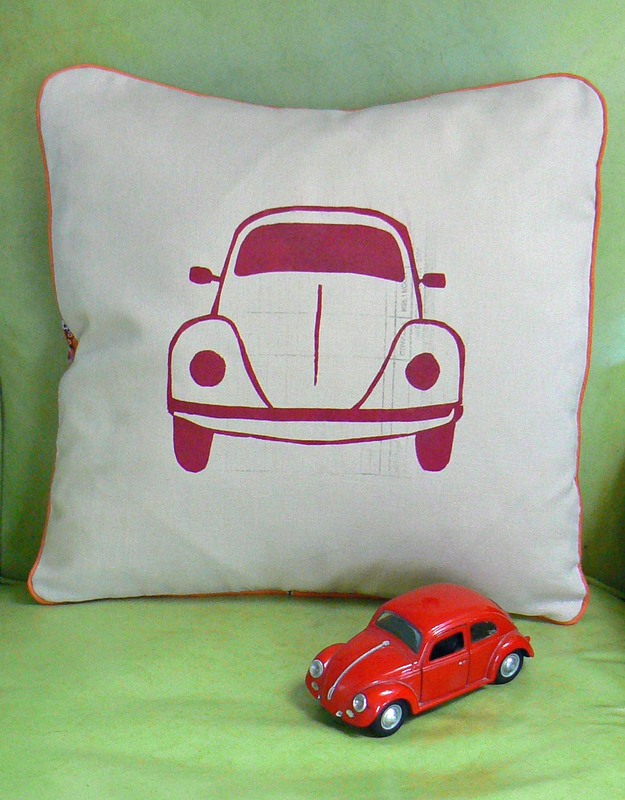 This VW bug pillow follows the VW bus pillowcases I made earlier this year in a series I’m now calling Vehicles I Have Known and Loved. 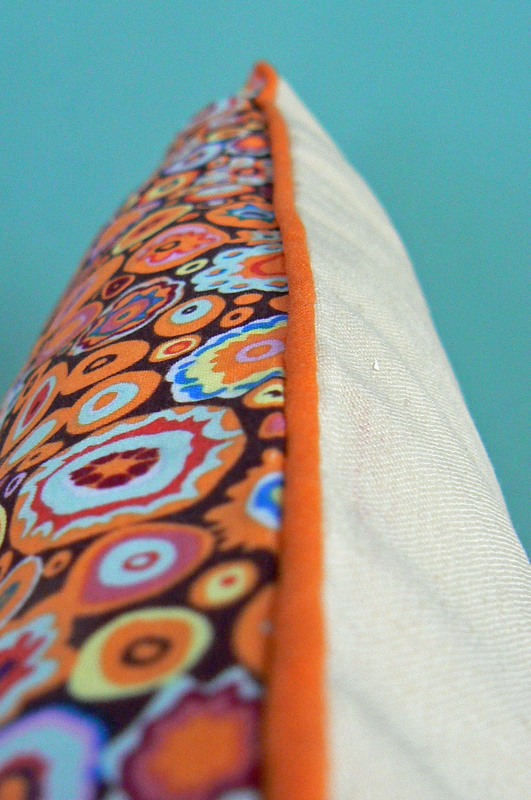 For the VW bug pillow, I used a pattern for an envelope enclosure. 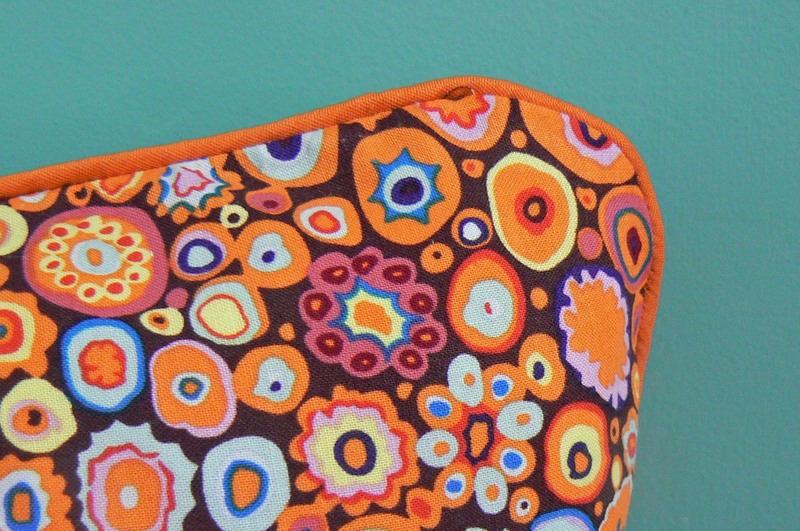 Beige linen in the front, groovy cotton print in the back, and orange piping. Next up for the vehicle stencil series is the true love of my childhood . . . the 1974 mini Winnie (that’s Winnebago, for the uninitiated). Long before I grew up to own a vinyl chair, I longed for this camper. I love your vee-hicle series! Yes, people in the south really do say vee-hicle… And I am envious of your piping skills. It looks so fancy! Is it hard? I’m glad you’re adding Southern drawl to your American & British influences. Your speech might get very interesting, indeed. Adding piping is super easy–otherwise I wouldn’t be able to do it. The piping guides the zipper foot, which makes it extra easy. But I am fed up with my machine–what kind do you use? I’m thinking I may have to request a new one for my birthday. Yep, my accent is getting really weird! A garbled mess. I use a Janome Gem and I love it. My mom just got the same and loves hers. It’s small and lightweight and not too complicated. I have the quilting model, which I think just means it comes with the attachments. I got mine for my 40th birthday, which made me really happy and feel dorky at the same time. Then I read that Tom Cruise gave Katie Holmes a sewing machine for her birthday and I felt super cool.